ALSO STARRING IN ALPHABETICAL ORDER: Thomas Andersen as "The Criminal Accountant", Lars Andersen as "Leif Dough", Michael Bech-Jensen as "Tag Roofer", John Bennetsen as "John Poop", Benno Bonde as "Benny", Christian Broberg as "Bridgeberg", Jesper Brøndum as "Taz the Caz", Lars Bo Christensen as "Ariel Sharon", Carsten Enggaard as "Mandy the Table Danser", Kristian Højgaard Madsen as "The Vagabond Attorney", Kristian Jensen as "Goldfinger", Michael Jensen as "Queen Mary", Kristian Knudsen as "The Wagonman", Christian Lindstrøm as "Kim Bodnia", Lasse Hjort Nebelung as "The Lung", Ulrik Nørgaard as "Mr. Gone", Henrik Nørmølle as "Carl Mar Mill the Incredible", Anders Pedersen as "The Drug Lord", Morten Poulsen as "Little Per", Joen Rosenmeier as "Nick Jay", Henrik Stage as "Holmes", Lars Ørbæk as "John Doe". Thanks to the following people who more or less made this movie possible: Financial controller: The godfather himself - Financial advisor: The Wife - Food and Beverages Quality Control: The Rold Big Inn - Environmental care: The Rold Big Inn staff - Music: All the good old originals - Songs & speeches: The selected - Technical Support: WebHouse ApS - Overseas Promotion: WebHouse ApS - Software & Hardware team and website: WebHouse ApS - Sponsor: TK Development A/S & Copenhagen Stock Exchange - Partnering Organisation: Round Table 81 Aalborg Denmark. 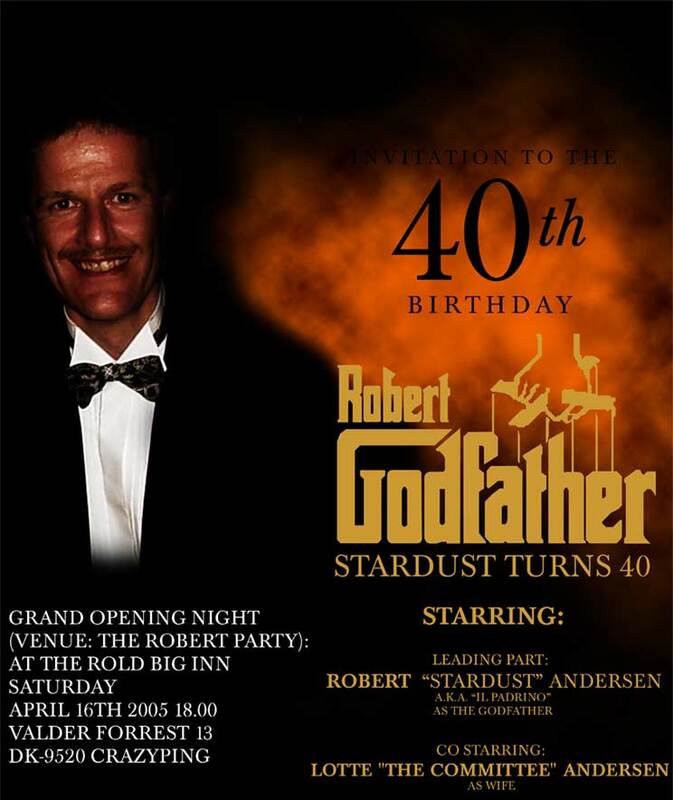 Original Soundtrack: "Tak til Robert Stardust"